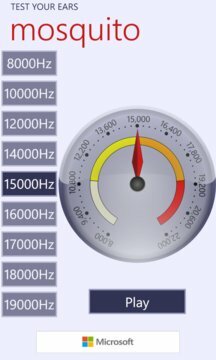 Humans hear frequencies from 20Hz to 20000Hz. As we get older, or exposed to loud sounds which damage our ears (such as loud rock concerts), the limits decrease. Most music resides between 40Hz (bass) and 15000Hz (cymbals). 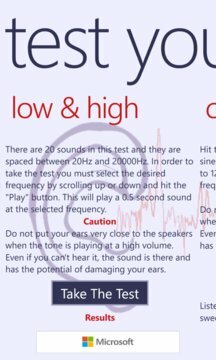 These tests help you test your hearing. If you can't hear any of the high frequencies played back during the tests, don't blame your speakers too quickly. Unlike low frequencies, high frequencies are easily reproduced, even with cheap speakers. Keep in mind that these tests are NOT a medical diagnosis.